Olives are the traditional tree crop of the Mediterranean Basin. 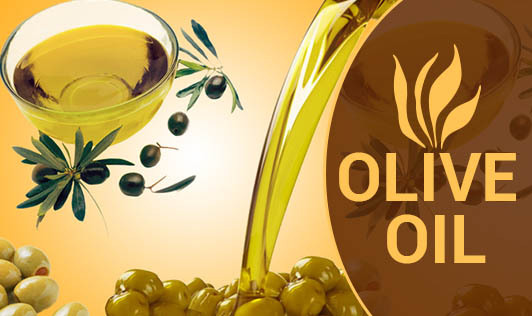 The oil is produced by crushing and pressing of olives and extracting by mechanical or chemical means. Olive oil is commonly used in cooking, cosmetics, pharmaceuticals, and soaps. The main type of fat found in olive oil is MUFAs (monounsaturated fatty acids) which is actually considered a healthy dietary fat. Olive oil is very low in saturated fats, contains omega-6 and 3 essential fatty acids making it as one of the healthiest cooking oils. Studies have proven that MUFA and PUFA, and the Phytosterols in olive oil have been beneficial. Myth: We cannot use olive oil for frying, as it will spoil the nutritive value of the oil. Fact: Olive oil has better smoking point than other oils, extra-virgin olive oil adds great fruity flavor, and sautéing over high heat doesn’t burn away the oil’s healthful antioxidants. Fact: : Olive oil, like other edible fats and oils starts deteriorating as soon as it is made. Olive oil has natural antioxidants but still does not improve with age. It is best to preserve its character for as long as possible. The best way is to store the oil is to keep it away from heat and light, in a airtight container. Combine olive oil, oregano, minced garlic and coriander. Spread on bread for homemade garlic bread. Add a dash of olive oil to scrambled eggs or to omelet or even frittata. Place olive oil and vinegar in a small dish and enjoy as a flavoring for a slice of crusty whole grain bread. Add extra virgin olive oil over healthy sautéed vegetables before serving.